Explore the Netherlands with AESU! While wood is often used to build durable furniture and stylish cabinetry, it isn’t typically synonymous with footwear. Leather, foam, and even certain textiles are common footwear materials, but for the people of the Netherlands, wooden shoes are an integral part of their culture. Are you curious to learn more about this peculiar tradition? Let’s explore! Just as tulips and windmills grace the picturesque landscapes of Holland, wooden shoes (Klompen) are a Dutch tradition. The exact origins of Klompen may be a mystery, but the oldest clog ever found dates back to 1230 AD. Before the 16th century, shoes were reserved for the wealthy Dutch, so more impoverished citizens had to find innovative alternatives to pricey leather goods. Enter wood, a cost-effective, malleable material that could provide ample protection from mud, dirt, and crisp winter weather. Clogs were said to maintain warmth during the winter months, keep feet cool during the summer months, and encourage good posture. The first guild of Dutch Klompen makes dates back to 1570. Men, women, and children typically had more than one pair of wooden clogs. One pair, worn for work or play, was kept plain. But the second pair, worn for church or weddings, was decorated with paint and carvings. Traditionally the clogs were painted yellow with red or black designs, and some even featured laces to mimic leather shoes. Since every pair of clogs was made by hand, each one was different and displayed the creator’s signature. 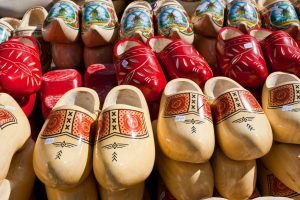 Travelers can find authentic Dutch clogs in shops throughout the Netherlands. While most of them are not made to be worn, they make wonderful gifts for friends and family. If you’re looking for Klompen to wear to your next event, consider purchasing a pair in the countryside from a professional Dutch clog maker! AESU offers several trips to Europe, including the Cosmopolitan, Euro Spree, Explorer, Euro Focus, and our most popular tour, the Great Escape. Explore the Netherlands and its rich history and culture. If you have any questions or want help booking your next adventure, please contact AESU by calling 800-638-7640, or fill out the contact form found on our website! This entry was posted on Wednesday, February 21st, 2018	at 9:08 am	. You can follow any responses to this entry through the RSS 2.0	feed. Both comments and pings are currently closed.